The founder of the Samkhya1 philosophical system and the author of the Samkhya-sutra was, as is generally believed, Kapila (c. 6th-5th centuries B. C.). The Samkhya-sutra was lost, so that we have to use later sources - Isvarakrishna Samkhya Karika (3rd-4th centuries C. E.), Vacaspati Misra's Samkhya Tattva Kaumudi (9th century), and others. Kapila's primary principle is that the world is material. Matter (prakrti) is the basis of every­thing that is, it is omnipresent, eternal, and one. The motion of prakrti is just as eternal as prakrti itself. Primordially, prakrti has no outside cause, for matter (prakrti) has neither beginning nor end. Kapila wrote that the world was not created, and therefore there was no creator; the world itself was the cause of the world; the world developed gradually. Kapila recognised the objective nature of the cause-and-effect links in nature, self-development of nature from the lower forms to the higher. The first sloka of the Samkhya-Karika says that there is continuity in the development of the world from the lower to the higher... Nothing can arise out of something that does not exist... There is a close tie between cause and effect. If that were not so, everywhere at any moment anything at all could arise. Each cause conditions a specific effect, and there can be no cause without an effect. The effect is always inseparable from the cause. Therefore any existence is conditioned. Kapila used the materialist doctrine of the cause-and-effect links to substantiate his atheism and to criticise the religion of Brahmanism. He wrote that, if the first cause is God (Brahma) and the world is the effect, there is a discrepancy between cause and effect. There can be, however, no discrepancy between cause and effect. The cause of this world is matter (prakrti). The universe is the result of modifications of matter. As we see, Kapila uses the category of causality from the very start in the exposition of his philosophical views. That is not accidental. The point is that the positions of Samkhya on causality were the decisive premise which deter­mined its philosophical orientation. In criticising Machism, Lenin pointed out: "The question of causality is particularly important in determining the philosophical line of any of the recent 'isms' ".2 As we see it, this idea of Lenin's is entirely valid, methodologically, relative to some of the oldest "isms". According to the Samkhya doctrine, everything (any phenomenon) has its material cause. All relations between cause and effect are conceived in the sense that the latter is always present in the former.3 The following are the Samkhya arguments in favour of this. There are two kinds of causes, material (in which the effect is latent) and efficient or pro­ductive (which helps the effect to manifest itself). If we accept, however, that the material cause does not contain the effect, the concept of "productive cause" loses its meaning, for it has no object of action. Assuming that an effect arises out of a cause in which it is not contained is tantamount to asserting that existence arises out of nonexistence, or some­thing emerges out of nothing. An effect must be of the same nature as the cause; they have the same basis. A cloth may only be made out of yarn (not out of milk); curds may be made out of milk (rather than out of yarn), etc. Thus Samkhya asserts that there are no effects without causes. Everything in nature has a cause of its own, including body and soul, sensations and intellect, which are "limited and dependent ob­jects". According to the Samkhya doctrine, prakrti consists of three forces or gunas - sativa, rajas, and tamas. Sativa is regarded as something light and illuminating; rajas, motivating and mobile; tamas, heavy and restraining. Analysis of the Samkhya Karika shows that in effect sativa IS potential consciousness; rajas, the source of motion, action, and development; tamas is that which re­strains action and slows down development. These three gunas, constituting the basis of any object or phenomenon, are inseparably connected and mutually condition one another. They are connected as closely as flame, oil, and lamp wick. The gunas are a kind of primary principles - ­mass (tamas), energy (rajas), and. the conscious principle (sativa).6 Everything in nature is charged, as it were, with these three principles. The interaction between them consists in that energy cannot exist without mass, while conscious phenomena do not exist without energy. How does an object or phenomenon emerge or is shaped, then? The process begins with individual particles of the three forces, indifferently scattered through primary matter, being gathered together into who~es under the impact of natural affinity; this results in non-uniform pressure in various parts of matter, so that bodies distinct from one another are gradually formed instead of uniform indifferent matter. The emergence or formation of some object or phenomenon does not signify creation of matter, In the same way as the disappearance of an individual object or phenomenon does not mean destruction of matter. In the process of evolution, nature does not increase or diminish quantitatively. Matter cannot be either created or destroyed. The sum total of all matter - of all its actual or potential states - always remains constant. The elements of matter are in eternal motion which cannot stop for a second even; any material process, any growth or withering away is nothing but redistribution of matter, its transition from the past into the present and from the present into the future, or from potentiality to actuality. Redistribu­tion of mass and energy engenders the entire diversity of the material world, the world of plants and animals. The idea that matter (mass and energy) does not grow or diminish quantitatively but is merely redistributed in the process of emergence and destruction of individual objects and phenomena of nature, can be regarded as one of the strokes of genius of ancient Indian thinkers who anticipated later discoveries. In a most general form, this can be viewed as a distinct expression of the idea of the Law of conservation of the mass of substance as it is known to modern natural science. It should be stressed at the same time that anticipation as one of the forms of perception of scientific truth was characteristic of many outstand­ing thinkers of antiquity. As Engels put it, thinkers of the past brilliantly anticipated countless numbers of truths whose correctness is now proved scientifically. Matter and the laws of its evolutionary de­velopment are knowable. The ways or channels through which man receives knowledge of the objects and phenomena surrounding him are the five sense organs. The entire infinite variety of matter is classified into five basic forms or essences: earth, water, fire, air, and ether. Samkhya regards the process of world manifestation as ordered development of matter from the finer forms to the most dense ones which are referred to as "material elements" (mahabhuta). These "essences" are similar to the Greek "elements", with the exception that what in Graeco-Roman philosophy is referred to as the "fifth essence" (quintessentia) is called the first essence, or spatiality (akaca) in Samkhya. We do not set ourselves the task of considering the interconnections and mutual relations between the gunas and essences, although this question is of great interest both on the epistemological and ontological plane. But we should dwell, however briefly, on the relationship between the gunas and prakrti. The point is that Samkhya is the first and probably the only philosophical school in India to make a serious attempt to formulate the philosophical concept of matter. We know that there were materialists in Europe (such as Ludwig Feuerbach, for instance, who rejected the abstract speculations of Hegel) who negated the existence of matter as the being of "the general", calling it "an empty abstraction", and recognised matter only as the being of individual things. From this viewpoint, only in­dividual things are genuinely material, like this house, this tree, these leaves, etc. That which is given in direct sense perception, that is, the individual sensual objects, is indeed material.7 This view, however, was deficient in divorcing the singular from the general, violating as it did their dialectic unity. Philosophers of the Samkhya school were also guilty of divorcing the singular from the general, but it is very important to point out that they recognised the reality of both. In their view, matter (prakrti) exists in two independent forms, one general and one singular, and that was where the metaphysical gap lay. Matter of the first form ("the general") is substance, the first cause of the world of objects; in it, the gunas are in a state of equilibrium, and it is therefore without qualities, which prevents man from perceiving it through the senses. It is there­fore incognisable, but the incognisability results from its fineness rather than from nonexistence. The stumbling block for the Samkhya authors was the question of the origin of consciousness. Ram Mohan Roy believes that purusa was created by Kapila as an explanation for the origin of consciousness. According to Kapila, purusa is the omniscient and extremely fine element which, as distinct from prakrti, possesses consciousness. Prakrti is the object or matter; purusa is the subject or conscious­ness. There are grounds to believe that Kapila was fearful lest this proposition of his should be given an idealistic interpretation. As distinct from atman, said Kapila, purusa does not create anything, it is passive; it is merely a passive witness; only prakrti is active, and so on. Prakrti is the subject of action; in the process of spontaneous de­velopment it comes in contact with purusa and ultimately cognises itself; purusa is devoid of the ability for self-cognition. The inconsistencies and errors of the Samkhya School relative to the origin and essence of con­sciousness were readily exploited already in antiquity by representatives of religious orthodoxy. In the Middle Ages, Gaudapada, Vacaspati Misra and other commentators (or followers) of Kapila's doctrine made further concessions to idealism, recognising the existence of souls independent of matter. Ram Mohan Roy holds an opposite view of the Samkhya philosophy, indicating that its weakness lies in negating the historicity of de­velopment. Had the Samkhya philosophy asserted that at a definite stage in the development of the world, consciousness (chaitanya) arises out of things, while quantitative changes, reaching a certain phase of development, become qualitative changes producing new qualities, then the whole inconsistency (asangati) would have disappeared. Correctly criticising the anti-historical (metaphy­sical) quality of the Samkhya philosophy, Roy regrettably commits an error himself, comparing Kapila's materialism to that of the French phi­losophers of the 18th century. The point is that the French materialism of the 18th century was a historical product of a qualitatively different epoch, and of a different class; it was different in its content. Such is a brief characteristic of the materialism pf the Samkhya School. Indologists differ as to the origin of the name of this philosophical system. The word samkhya has two principal meanings: (I) count or computation; (2) profound meditation, reasoning, counting the pros and cons, struggle both in the intellectual and physical senses. Taking into account the first meaning, Gough explains the name Samkhya from the fact that in this system the principles of the U panisads were listed. We believe that the scholars who reckon with the second meaning (like S. Radhakrishnan, Ram Mohan Roy, and others), have a better case. The meanings of the word Samkhya is close to Gr. philosophia, dialektike. V. I. Lenin, "Materialism and Empirio-Criticism", Col­lected Works, Vol. 14, p. 153. Let us point out that Buddhists, Nyayiks and Vaisesikas adhere to another view of this question. They believe that the effect does not actually exist in the material cause. Their argument is that if the effect existed in the material cause, there would be no need for the efficient cause. (If, for instance, the pot actually exists in the clay, what is the potter for?). The theory (vada) that the effect does not exist in the material cause before it is produced is sometimes called Arambha-vada, that is, the theory of the origin of the new in the effect. S. Radhakrishnan, Indian Philosophy., Vol. II, p. 260. 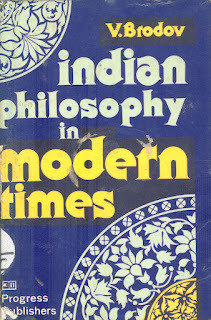 S. Dasgupta (see A History of Indian Philosophy,. Vol. I, Cambridge, 1922, pp. 244-245) interprets sativa as "intelligence-­stuff"; rajas, as "energy-stuff", and tamas, as "mass-stuff". This view has its sources in the nominalist tradition. In the Middle Ages nominalism, according to Marx, was the first expression of materialism which struggled against medieval scholasticism. The progressive thinkers of the 17th century (in particular Hobbes, Locke, and Spinoza in his theory of the individual things) also relied on nominalist principles in their fight against Aristotlean scholasticism. French materialists also turned to that tradition as an antidote to objective idealism. Pradhana - prakrti in the state of equilibrium of the gunas - is just as unknowable as the Kantian thing-in-itself. Prakrti is knowable only in the state of non-equilibrium of the gunas, that is, what is knowable here is the dynamics of the gunas rather than pradhana; the transition from pure potentiality (avyaktam) to actuality (vyaktam) is cognised. Not surprised - the book was published during the Communist times and hence some fabrication and misrepresentation of concepts to support the Soviet cause. Indeed Prakriti is material but Purusha or pure consciousness is not. Ayurveda is a practical implementation of the Samkhya concepts - but it points out the spiritual cause (or non-cause) of existence. True, most of the works published in USSR had an ideological axe to grind. Why philosophical works, even some of the pure scientific enterprises were twisted out of shape during the soviet regime. How can one forget the psuedo-scientist Lysenko's rejection of Mendelian genetics, stalling the progress of soviet agricultural/biological sciences for decades? Brodov does quote Marx, Lenin, and all in his book. But we don't think there was any conscious attempt to misrepresent Indian Philosophy in his works. Well, one may not agree with Brodov's view on Materialism in Samkhya philosophy. But that is a different matter. The metaphysical element (purusha) is more than ordinary consciousness. Prakriti is the original matter from which all nature, all the universe is derived. Samkhya and atheistic materialism Lokayata-Carvaka agree on one crucial point s unlike other philosophies both systems accept that matter (prakriti) is real, this is denied by Buddhism, Advaita Vedanta and others astika thought that assume everything is maya (illusion) for lokayatas matter is real, like the Sankhya. Also agree on the absence of God, strong arguments in the Sankhya philosophy of the no existence of creator ishvara. However away from the materialistic atheism agnosticism and skepticism when considering samkhya very similar to Jainism in his philosophy, concept of Moksha (liberation), karma (causal theory) samsara (transmigration). Anyway Samkhya is an extraordinary spiritual philosophy, but disagree on many things Carvaka conception.